You have played the game – now read the book to find out how it all began. The Wizards of Midgård channel the Eight Elements to perform astounding (and often destructive) feats of Magick. They are sworn to use their powers for good, never for evil – and only occasionally for the sheer fun of blowing things up. There have long been rumors of a mythical Ninth Element that grants ultimate power to the Wizard who masters it. The Order of Magick says there is no such thing. 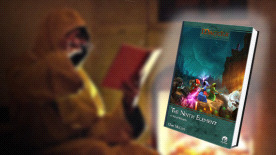 But when a mysterious Purple Wizard steals an ancient artifact that just may be a key to unlocking the (alleged) Ninth Element, the Order wants it back at any cost ... just in case. Naturally, they send four inexperienced student Wizards to do the job.